In the 16th century, one woman forever changed the course of Mexico�s history. She served Hern�n Cort�s as his translator and mistress and without her assistance, the Spanish conquistador would likely have been defeated. She was a woman who had many names, Malintzin in her youth and Do�a Marina, after she had been christened. However, today the name she is frequently remembered by is La Malinche or simply, Malinche. Her name has become synonymous with hatred and scorn. Many look upon her as a traitor and hold her responsible for contributing directly to the conquest of her people. Early accounts of her life indicate she was noble-born to a father who was the ruler of the N�huatl-speaking village of Paynala. Generally, her date of birth is attributed to the year 1505 with the year of her death, 1529. However, there is some evidence that she may have lived longer. Malinche received an education, which was rare for a female in her society. Undoubtedly, it was her father�s status that afforded Malinche this privilege. Unfortunately, her father died when she was still a young girl and this tragic event forever changed her life. Before long, Malinche�s mother remarried and gave birth to a son. Sadly, Malinche was no longer welcome in the home and was either sold or given away to Maya slave-traders. Perhaps, the mother was forced to abandon her child. Some speculate that Malinche threatened the son�s future inheritance. Regardless, the chain of events that followed held greater consequences than anyone could imagine. In 1519, Cort�s and his men won a battle against a Mayan settlement in the area of present-day Tabasco. As a form of tribute, 20 Indian slaves were presented to the Spaniards. Malinche was amongst them. Her unique knowledge of N�huatl, the Aztec language, as well as Mayan dialects, came to the attention of Cort�s. Another translator was already a part of Cort�s� entourage, a Spanish priest by the name of Ger�nimo de Aguilar. This priest was imprisoned by the Mayans for several years and had learned their language. This proved an invaluable asset to Cort�s. However, they soon encountered Indians who only spoke N�huatl. The priest initially played a role in these translations. 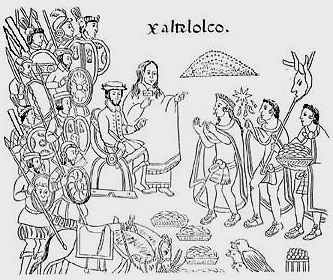 The representatives of Montezuma would speak N�huatl with Malinche, who in turn would translate their words into Mayan for Aguilar. The priest would then translate the Mayan into Spanish, for the benefit of Cort�s. Before long, however, Malinche learned Spanish and became the direct interpreter for Cort�s. Cort�s utilized Malinche�s linguistic abilities to his advantage in his negotiations with the Aztec Empire. Indeed, Malinche arranged and mediated the introductions and meetings between Montezuma and Cort�s. 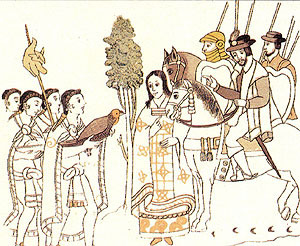 Montezuma carefully considered the Spanish conquistador the return of Quetzacoatl. However, this illusion evaporated when he realized Cort�s� true intent. Malinche became more than just an interpreter for Cort�s. Christened with her new name of Dona Marina, she became the Spaniard�s mistress and in 1522, bore him a son named Don Mart�n Cort�s. Their child represents one of the first known Mestizos, an individual whose blood is a mixture of European and indigenous American. However, after the affair between Cort�s and Malinche came to an end, she married another Spaniard named Juan Jaramillo. Their union produced a daughter, Maria Jaramillo. Malinche�s ability to communicate and negotiate with various tribes allowed the Spanish to march through territories without being attacked. They picked up converts along the way. Many indigenous people joined Cort�s and fought by his side. These tribes were motivated to join the Spanish, in hope of defeating their long-standing enemy, the Aztecs. This brutal and mighty empire had subjugated them for far too long. Today, in Mexico a derogatory name to call someone is a �malinchista�, a person who turns their back on their own culture. Interestingly enough, some do not consider Malinche a traitor. Some view her as a heroine, helping spread the word of Christianity. For others, she was a woman in love, who had no choice but to follow her heart and protect her beloved Cort�s. Malinche is viewed as well with honor by those who consider her one of the first �mothers� of the Mestizo race. Regardless of how one perceives Malinche, she forever changed the course of Mexico�s destiny.